Israeli Prime Minister Benjamin Netanyahu's Interview with ABC's George Stephanopoulos. Click to play. Full Transcript of Interview on "Good Morning America"
GEORGE STEPHANOPOULOS: Mr. Prime Minister, thank you very much for doing this. BENJAMIN NETANYAHU: Thank you. Good to be with you, George. STEPHANOPOULOS: It's pretty clear that the U.S.-Israel relationship has … hit some hard bumps in recent weeks. Who's to blame for that? NETANYAHU: Oh God. I think with any family, with any relationship, the relationship of allies, even your relatives, you have ups and downs. You have disagreements. But I think this relationship between the United States of America and the people of Israel is rock solid. We … have a great … I would say a great conformity of interests and values that will … get us through this. And we'll try to work out the disagreements in a way that is commensurate with that spirit. STEPHANOPOULOS: Let's talk about some of the disagreements. The President -- you met with the President on March 23rd. It was an extraordinary visit-- to the White House and no public pictures. The President apparently kept you waiting-- while he went up and had dinner and left you waiting in the Roosevelt Room. And it's been reported that the President made several demands. That Israel freeze all settlements in East Jerusalem and that Israel be prepared in these indirect peace talks to start to talk about the substance on … boundaries. On Jerusalem. On refugees. Have you told the President that … you're prepared to meet the demands he set out? NETANYAHU: You know have so many assumptions in that question so let me parse them out. One, I don't know how the meeting was perceived but I don't think there was any such intention on the part of the President. I think we have some outstanding issues. We're trying to resolve them through diplomatic channels in the best way that we can. Second, on the question of Jerusalem we've had-- not my personal policy but the policy of … all governments including Yitzhak Rabin's, Golda Meir's, Shimon Peres for the last 42 years. Now the Palestinian demand - and I don't … I'm not saying what the American position is. But the Palestinian demand is that we prevent Jews from building in Jewish neighborhoods in Jerusalem. That is, you know, that is an unacceptable demand. If we made it in London or made it in New York or in Paris, people would cry foul. The issue of Jerusalem would be discussed and will be discussed in the final settlement and negotiations. But to bring it forward, to say that these neighborhoods that are part and parcel of … Jerusalem, they're not isolated hilltops in the West Bank. They're about four minutes' drive from here. About 200,000 Israelis live there. The (pronunciation unclear) neighborhood that was -- in the news was populated by Yizhak Rabin. He wasn't against peace. Neither were all the other prime ministers, including until a year ago, that were building in these neighborhoods, these Jewish neighborhoods in Jerusalem. And the Palestinians were negotiating peace with them. This demand that they've now introduced, the Palestinians, to stop all construction, Jewish construction in Jewish neighborhoods in Jerusalem, is totally, totally a nonstarter. And in fact that's exactly what the Palestinians are doing - to us. I want peace. I want to negotiate peace. I say let's remove all preconditions, including those on Jerusalem. Let's get into the room and negotiate peace without preconditions. That's the simplest way to get to peace. STEPHANOPOULOS: Sir, it seems like you and President Obama then are still at odds on this whole issue of whether there should be a settlement freeze right now. If that's the case how do you get these talks started again? NETANYAHU: No, in fact … I'm the one who initiated -- that's unprecedented. A settlement freeze - in the territories. Again, in Jerusalem, we're talking about neighborhoods, not settlements and their urban areas right next to this office in the heart of Jerusalem. But look, I did three things when I came in and I think people have to understand how much we've taken steps for peace. First thing is I said, and I think … as a (pronunciation unclear) leader, it wasn't easy for me to do. I said we're ready to have a solution of peace of two states for two people. Then I removed hundreds of roadblocks and checkpoints, which makes the West Bank economy boom. I mean … they've got coffee shops. They've got shopping malls. They've got restaurants. They've got e-businesses. You name it. It's great. But it hasn't been done before. We helped make it happen because of the change of policy. Third, I actually froze new construction in the … settlements for a period of 10 months, something that hasn't been done before and which Secretary of State Clinton said was unprecedented. That's what we did for peace because we want peace. And unfortunately, the Palestinians so far have not responded in kind because what they've done is named public square honoring -- public squares, in fact, honoring terrorists who've murdered hundreds of innocent Israelis, including innocent Americans. And they're loading the deck with all sorts of demands and requests for preconditions that make the starting of negotiations impossible. I hope they'll change their mind. I hope they'll enter negotiations. And … I don't think it's that difficult to do once you remove all these preconditions we've have never been put before. I think let's go back to negotiations directly and without preconditions. Or indirectly. But without preconditions. That's the way to get to peace. STEPHANOPOULOS: Yeah. As … you know, sir, a lot of those neighborhoods in East Jerusalem were empty lands as recently as 1993 when Yitzhak Rabin met Yasser Arafat on … the White House lawn. They are next to Palestinian neighborhoods. Not contiguous to other settlements, which is one of the reasons why President Obama has … called for a freeze. It does seem to be your position right now is fairly clear on that. I would just say what would be your reaction then if the President decides, as he's been advised by some, to put a United States peace plan on the table? NETANYAHU: : Well, first of all, on these neighborhoods which are part and parcel of Jerusalem and has not displaced anyone and no Palestinian, Palestinians live in their … in Palestinian neighborhoods in Jerusalem. Jews live in Jerusalem neighborhoods. And everybody, in any peace plan that I know, every single one-- including in the Camp David summit of … 2000 and including in other programs that have been put forward, in every single peace plan these neighborhoods will, Jewish neighborhoods will remain part of Jerusalem and part of Israel. And so the the real question is why are we arguing about something that's not a real argument? I don't think that it makes any sense. As far as the idea of a imposed settlement, I … don't believe anyone will seriously think that you can impose peace. Peace has to come from the parties sitting down with each other, resolving their differences. And this is what we want to achieve. This is what I want to achieve. And I've taken steps in words and deeds in the last year to do that. And I … think the Palestinians have to show that they're committed. The quickest way to prove that is to remove preconditions, get in the room and start negotiating. STEPHANOPOULOS: Let me follow up on that. President Obama has said it's very clear that he believes that making progress in this peace and negotiations is in a vital U.S. national security interest. Is it in the vital national security interests of Israel? And how worried are you about the prospect of war that King Abdullah of Jordan has raised? He said if no progress is made by this summer war could break out? 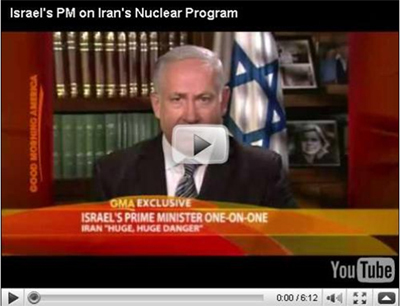 NETANYAHU: I … think no one wants war. And certainly Israel doesn't want war. Israel wants peace. We … yearn for peace. It's a vital interest for us. You know, we know the pains of war. I -- last night I just went to the cemetery to visit the grave of my brother who fell while rescuing the hostages at Entebbe. I myself was wounded in a battle to rescue a hijacked Sabina airplane. I've lost friends and relatives in the wars of Israel. I don't want my children or the Palestinian children or anyone's children to suffer through a war. So we don't have to be goaded into peace. We want peace. The people of Israel want peace, pray for peace, yearn for peace. And I want peace. That is in our interest. And I think the important thing is that it'll be a real peace. A peace that we can defend. In our neighborhood -- it's a very tough neighborhood, the only peace that lasts is a peace that you can defend. Peace with security. This is something that we can only negotiate with our Palestinian neighbors or with any one of our other neighbors who want peace. You can only make peace with those of your neighbors who want peace. We want peace. We are ready for peace. I've been calling for peace. And I hope that we'll move on the path of peace as soon as we can. STEPHANOPOULOS: And you're not worried that war could break out this summer? NETANYAHU: If it's up to us, there won't be any war. I've heard these attempts to destabilize the area and … it's not a secret that Iran is goading this through Hezbollah they're trying to create tensions, probably to deflect world attention from Iran's advancement and its plan to develop nuclear weapons. It is trying to distract the agenda on false charges against Israel. STEPHANOPOULOS: Mr. Prime Minister, thank you for joining us again. Let's talk about Iran. Headline in the New York Times today … about a memo Defense Secretary Gates wrote back in January. Secret memorandum where he outlined his fear that the United States does not have an effective long range policy to take on Iran's nuclear program. Do you share that fear? NETANYAHU: Look, we all are concerned with Iran. I don't get into internal American calculations, but … you know, I spoke with President Obama when he was Senator Obama. He visited Israel. And I was the leader of the opposition at … that time. And I said … if he gets elected President, I said to then-Senator Obama, all the issues that will flood his desk will one day be pushed aside by one overriding issue. And that is if Iran attempts to develop atomic bombs. Because they could very well either use it or threaten to use it or threaten to give it to terrorists or even give them a crude device with fissionable material that can be put in a container ship. And this could come to Manhattan or to any port in the United States or in Europe or, for that matter, in Israel. It's a huge, huge danger. It's the biggest issue facing our times. And I think that … president has expressed his understanding of how serious a challenge it is. And we all should work together as world leaders to make sure that that challenge is met. That Iran does not acquire nuclear weapons. STEPHANOPOULOS: But if the current effort designed to get a sanctions resolution of the U.N. Security Council, is that effective? NETANYAHU: Will the U.N. resolution affect it or the failure to pass the U.N. resolution on it? STEPHANOPOULOS: … we've had three U.N. resolutions so far and … the Iranis have continued to develop their nuclear program. Do you believe that this next round of sanctions being discussed in the U.N. Security Council can be effective? NETANYAHU: I don't know about the Security Council. I hope so. And certainly the international community can … deliver crippling sanctions. Let me tell you what they are. If you stop … Iran from importing - refined petroleum, that's a fancy word for gasoline, then Iran simply doesn't have refining capacity and this regime comes to a halt. I think that's crippling sanctions. Now if the U.N. Security Council doesn't pass it because they'll dilute the resolution to get acquiescence of their members, then certainly the United States and other willing partners in the international community can do it outside. Can enforce these sanctions outside the Security Council. There is a way to deliver these crippling sanctions. This should be done now. NETANYAHU: In any case, the message should be clear to Iran that it will not be allowed to develop nuclear weapons. STEPHANOPOULOS: But Mr. Prime Minister, you know China's not willing to go along with those crippling sanctions. Last week I spoke with Russian President Dmitry Medvedev. He made it clear that he was not willing to go along with those crippling sanctions. Then where are you left? NETANYAHU: You're left with doing it outside the Security Council. There's a coalition of the willing and you can have very powerful sanctions. I think this is a minimal requirement right now to, not really to send messages but to actually make this regime begin to make choices. Because right now they feel they don't have to make choices. They … understand that the spotlight is on them but they're not doing anything. And the critical thing is I think there's an understanding in … Washington, certainly … in Jerusalem and … quite a few other capitals in the world, that very forceful action has to be taken to make Iran stop. I think the future … of peace in the world and of stability and security is at stake. STEPHANOPOULOS: You're right that there are … majorities that believe in both houses of the U.S. Congress, who've expressed a willingness to go along with those sanctions. But so far President Obama hasn't joined them. Has he given you an assurance that's he willing to go for -- for sanctions like that? STEPHANOPOULOS: A majority in both houses of Congress have expressed a willingness to go along with the kind of petroleum sanctions you've outlined, but so far President Obama has not been willing to state that publicly. Has he given you an assurance that he's willing to go for crippling sanctions? NETANYAHU: Well, what the United States has said is that they're determined to prevent Iran from developing nuclear weapons. And I … think that's-- an important statement. I -- look, I've been talking about this for 14 years. When I was first elected prime minister-- the first time-- 14 years (ago) I was given the opportunity to address both sessions of Congress. And I said at that time that the single greatest threat to mankind is Iran's attempt to develop nuclear weapons. And a lot of eyebrows were raised 14 years ago. They're not raised now. And … I think the President of the United States, the government of the United States has seized of the situation. There're several ways that this can be blocked. Crippling sanctions on petroleum import. And we find petroleum import is one of them. There are others. STEPHANOPOULOS: How much time do we have? I mean … U.S. military officials went before the Congress this week and said that they expect that Iran will have the materials to develop one nuclear weapon in about a year. And probably be actually able to develop the actual weapons in two to five years. Is that your assessment as well? BENJAMIN NETANYAHU: I'm not gonna get into concrete assessments. I will say that-- we have a lot less time with each day that passes. And the crucial thing is to use the time available for forceful international action led by the United States. If you can go through the Security Council. If you can't, go outside the Security Council. But there are several ways to … stop this. And if the international community led by the United States or a community of nations, concerned nations, led by the United States, is seriously determined to stop it, this can be stopped. STEPHANOPOULOS: I know it is the policy of Israel to prevent Iran from getting a nuclear weapon, but what is the specific line they can't cross? If … they move up to the line of … making a weapon, they have the weapons material but don't construct it, don't put it together, is that something Israel can live with? NETANYAHU: Well, I'm not gonna get into those details. I think everybody understands a nuclear program when they see it. We see it in the making. Everybody understands that if Iran is not stopped. But go ahead and make nuclear bombs with the-- which will make a terrorist regime. You know, it'll really put the greatest danger in front of us. That the world's most dangerous regimes -- with the world's most dangerous terrorist proxies -- could acquire the world's most dangerous weapons. That's something that should be stopped. We shouldn't parse it out and begin to, you know, to parse it out into splitting hairs. We understand what they're doing. They understand that we understand what they're doing. And it's up to the leading nations of the world, of course with the leadership of the United States, to stop it. STEPHANOPOULOS: But it's fair to say that Israel will not permit, in your view … on your watch, Iran to get a nuclear weapon? NETANYAHU: Our preference is that the international community, led by the United States-- stop this nuclear weapons program. Having said that, I … would say that, you know, we're in the eve of Israel's Independence Day. And the fortunes of the Jewish people were such that we could never defend ourselves until we re-establish the Jewish state. We paid a horrible price in the Holocaust and before the Holocaust. And of course the changes that -- there is a Jewish state now that always reserves the right to defend the Jewish nation. STEPHANOPOULOS: President Ahmadinejad as you know is convening (?) his own nuclear conference in Iran this weekend. At the conference he called Israel a microbe on the verge of collapse. I think that's one translation of his words. And one of the points he's been making is that Israel is being hypocritical. They've developed their own nuclear program. He said many times he believes Israel has nuclear weapons. Why not call his bluff and sign the non-proliferation treaty and abide by the non-proliferation treaty? NETANYAHU: Well, we have a long standing policy and we're not about to change it. But let me tell you this. People sign the nuclear non-proliferation treaty, the NPT. That doesn't guarantee anything. You know who signed it? Iraq under Saddam Hussein when they build the Osirack nuclear reactor. They violated it … Even though they were signatories. Libya that had a secret nuclear program. They were signatories to the NPT. Though they -- even though they violated it. In fact Syria (who) recently was building a reactor, a secret reactor in violation of the NPT, they were signatories to the NPT. And Iran itself, that is violating left and right the NPT … even taking people into guided tours of the centrifuge holes, it's a signatory to the NPT. So that doesn't really help you. You know, if the world changes, if the, you know, if the Middle East one day advances to a messianic age where the lion lie down with the lambs, then you can ask me this question again, George. STEPHANOPOULOS: But you … so no time soon will Israel sign the NPT? NETANYAHU: No, we will not change our policies. I wanna make it clear. Those people-- those states who have signed the NPT have violated it left and right. And the Middle East-- the problem in the Middle East is not this or that treaty or these or that signatories. The problem is … those regimes that call directly for Israel's destruction are developing atomic weapons, weapons of mass death, to achieve that destruction. And so it's not whether we sign or whether they sign and are signatories to it. It's how do we prevent these people, these states, these regimes, these leaders like Ahmadinejad, from acquiring nuclear weapons. That's the main focus of the international community. And that certainly is -- should be the focus of -- everyone concerned with peace and security. STEPHANOPOULOS: Final question, sir. You've likened the U.S.-Israel relationship at the top to a family. To a family that goes through ups and downs. What will it take for the U.S. and Israel to be one big happy family again? And when do you expect peace talks with the Palestinians to begin? NETANYAHU: I hope as soon as possible. I've been calling for peace talks from day one. I extended my hand to the Palestinians. I've done all these things … that I told you. Gestures for peace. Stopping the road blocks. Calling for a two state solution I'm waiting and eager for them to come back. If think they're not asked to put aside all preconditions and negotiate, they're not gonna do it. And I'm -- we've been talking to the United States. We've been talking -- I've been talking to the President. We've been talking through diplomatic channels. I hope that we can get this together. But it should be clear that there's a bond between us that I think supersedes these questions. And I think the important thing is to use that bond to get all the enemies of peace and all the enemies of the United States to move back. In fact there is a big contest in the area it's not merely here with the Palestinians. I think that's the minor part. And I think with good intentions, which we have-- and with the United States' assistance, we can get to peace. But there's a larger force of radical Islam that wants to eradicate peace. Wants to eradicate Israel. Wants to eradicate any American presence in the Middle East. They hate America because of what America stands for. They'll stop America-- they'll stop hating America only when America stops being America. When it stops espousing a free society, pluralism, open debate. That's what they despise. And in fact they don't hate American because … of Israel. They hate Israel because of America. Because they see us as an outpost of that free, open civilization that you represent. And you know what? They're right. And to the extent that the American-Israeli relationship is close, to that extent militant Islam recedes. To that extent everybody watching on the sidelines understand that our partnership, along with a moderate Arab states, will win out. To the extent that we have risks -- they think otherwise. They … may think otherwise right now but they're wrong. That partnership is strong. Our quest for peace is strong. And we'll stand against these extremists and ultimately defeat them. STEPHANOPOULOS: Mr. Prime Minister, thank you very much for your time.